Justin Rose took a step closer to the world number one spot after snatching the lead at the BMW Championship with a six-under round of 64. The Englishman spearheaded a British contingent who moved in at the top of the leaderboard after rain-delayed play resumed in Philadelphia on Saturday. 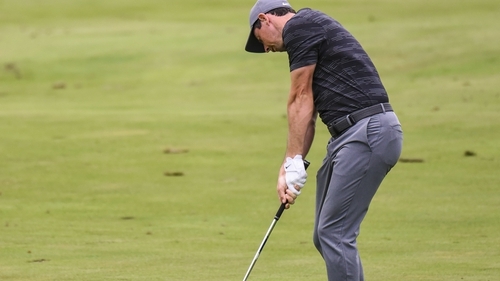 Chasing his 10th PGA Tour title, Rose charged through the front nine on day three at the Aronimink Golf Club in 29 thanks to half a dozen birdies. Rose made it back to the clubhouse without dropping a shot and edged ahead of round two leader Xander Schauffele, whose 67 saw him slide into second on 16 under overall. The American sits a shot off the pace with Rory McIlroy, who recovered from a second-round slip-up with a round of 63, right behind. After an encouraging start the Northern Irishman suffered a scare on the eighth, but quickly regained composure and bounced back on the ninth with an eagle. The best round of the day saw Tommy Fleetwood's 62 put him on 15 under overall, tying the Englishman in fourth with Rickie Fowler of the US. All three are on the European Ryder Cup squad heading to Spain later this month. After a tricky second round Tiger Woods tried to regain lost ground on Saturday, but his four-under round of 66 was not enough to make much of a difference. He rose one place up the board to sit tied in 11th on 12 under overall. It was a better day for Open Championship winner Francesco Molinari, whose 64 pulled him 13 places up the board to tie for seventh. Ian Poulter, who will also be heading to Spain, carded a 67 to climb four spots into 44th and go five under overall. A win in Philadelphia should be enough for Rose to take the crown of world number one from Dustin Johnson. The American, along with world number two Brooks Koepka, were tied in 33rd after round three on eight under overall.